Today while taking my dog Yuki for a walk, I saw a dahlia which extremely impressed me with its play of colours. Darkred with fuchsia colour at the borders and very comely´ n charming. After thinking about this step quite thoroughly I went to the neighbours house to ask if I could get this one for showing it in my blog. 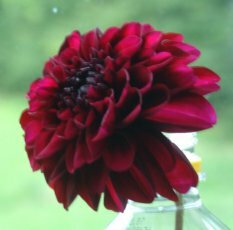 Many thanks to the Röschke family from number 4, who provided me with this unique dahlia. Isn´t this flower a little masterwork? Today in a flash of creativity I handicrafted two stitch markers. As a model I used the pictures of stitch markers in the March 2006 issue of the "simply knitting" magazine which I got as a present from Abby who had to move from Cork (IRE) to GB. 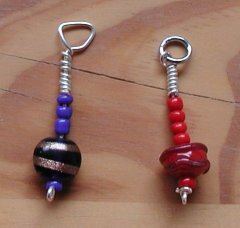 Originally in this issue there were 5 stitch markers included but of course they stayed with Abby. But nobody else has such nice ones like mine, because I made mine by myself. I used the silver jewellery wire from my favourite bead shop Loewenherz (engl. : lionheart) which was my last but one remain in this gauge and I used galvanazied iron wire from the Obi do-it-yourself store (1mm thick and 24m long for only 2 Euros) to create the skeletal structure of the markers. For one of the stitch markers I used a ready iron ring from a keychain. The big blue bead was inside a set of beads from the discounter supermarket "netto", the little blue beads are from the turkish market in Berlin - Kreuzberg, the little red beads are from Loewenherz too. At my last visit there these where the last ones of this kind. The big red bead was created from a acquaintance of mine called Marit - who sent some of her beads as samples for my necklace. I liked all of her glass- beads, not only the ones which I choose for my necklace and so I got all of them for a special price. And now I used this bead reasonable too. Marit is creating beads, buttons and other things out of glass. Just have a look at her Onlineshop ! The prizes are really good valued and the qualitiy is extremely high and good. Plus the shipping is done rapidly and nothing will break to pieces. AND she produces everything she can just custom - made. These stitch markes were fast and easily maid just as it looks like and you can use your favourite colours. My advice for these is to absolutely avoid the usage of too big beads and too long markers, because it would be very inexpedient for knitting in rounds with sock needles. Today I bought sock needles in gauge 4 at the huge "Kaufland" supermarket and quite liked the prize. I think that if I want to use the chunkier wool which I brought I will surely find them usefull.